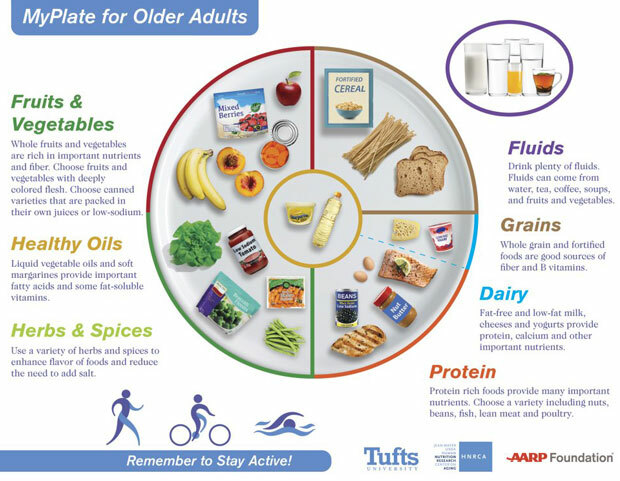 Last week the newly adjusted MyPlate for Older Adults was released and blends new USDA recommendations with the shifting senior nutritional needs. MyPlate for Older Adults is based on the 2015-2020 Dietary Guidelines for Americans. While most guidelines apply to adults of any age, the new MyPlate offers adjustments to meet the needs of older Americans. Below are the highlights of a healthy plate for seniors. Fruits and veggies dominate. Fruits and vegetables fill nearly half of the retooled MyPlate. Dark, leafy vegetables are particularly rich in nutrients, said panelist Alice Lichtenstein, the vice chair of the 2015 Dietary Guidelines Advisory Committee. And plant-based foods are an important source of fiber. Colorful choices are healthy. Whole fruits and vegetables with deeply colored flesh are best. Berries, which may protect aging brains, are part of the MyPlate picture. Calories matter. As people get older, their need for energy from food – which means calories – decreases, said Lichtenstein, who is head of the Cardiovascular Nutrition Laboratory at the USDA Jean Mayer Human Nutrition Research Center on Aging at Tufts University. So strategic food choices include getting more nutrition from fewer calories. Herbs and spices boost flavor. Who needs salt? A wide variety of herbs enhance the flavor of foods without bumping up blood pressure, panelists pointed out. Healthy oils for healthy fat. Liquid vegetables oils and soft margarine fill the center MyPlate circle. That’s because they provide an important source of fatty acids and some fat-soluble vitamins. Protein comes in many sources. Nuts, beans, fish, lean meat and eggs all provide protein. MyPlate recommends choosing a variety of sources, including certain dairy products. Dairy has a place. Milk, cheeses and yogurts contain calcium, protein and other nutrients. The key is choosing fat-free or low-fat versions, according to MyPlate. Grains give fiber. Whole grains, such as pasta and bread, and fortified foods including cereal provide dietary fiber and B vitamins. “For older adults, there’s more emphasis on grains – especially whole grains,” Lichtenstein says. The “active” ingredient. To emphasize the importance of regular exercise for seniors, physical activity is incorporated in the “placemat” section of the new MyPlate, with symbols of walking, biking and swimming. Please visit the source article for more information.